There is a great deal of space for electric guitarist Scott Fields and tenor saxophonist Matthias Schubert to fill on this recent duo outing. "In the Minaret Minuets system there are two separate but equal branches: the electric guitar and the tenor saxophone. 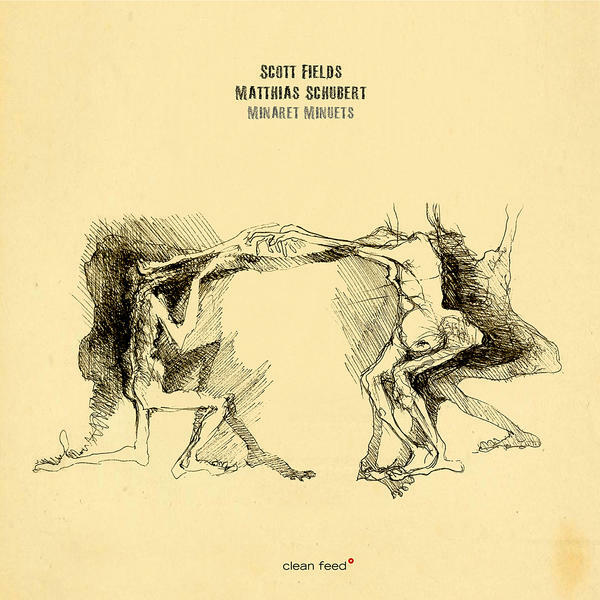 Composer slash instrumentalists — those roles smear — Scott Fields and Matthias Schubert find myriad methods to blend and contrast, to appear to be at one moment a larger ensemble and then to sound as just one." I do not think I could have composed a better summation of the music within -- the tracks feel organically grown and composed by the spontaneous reactions between the musicians, running the gamut from tiny sounds produced by the acoustics surrounding the instruments to playing at their extremes. Without the grounding of bass or percussion and sans any traditional song structure, all emphasis is shifted to the musician's interplay and sonic atmosphere. For example, there is a passage about halfway into the extended "Will's Billy Beer" where the guitar melody skitters over light saxophonic flatulence. So intimate, barely making a sound, the woodwind's breathiness provides just enough subtle support for the delicate melody. Soon, everything from key clicks to short snippets of melody from the sax begin interacting with string scratches and muted pickings. It's the textures of sound bouncing off each other that make such sparse moments so effective. Their approach seems to capture emotions and subconscious thoughts more than overt statements. But all is not calm, while there are great expanses of ruminative rambling, there are also moments of rambunctious raucousness. The 7-minute "Multi Trill" begins exhilaratingly - all skronk und drang - but eventually settles into a more lyrical flow. "Santa on a Segway" has moments of sweetness and synergy where the rhythms and tones between the two players meld delightfully. This is a long recording - clocking in around the 75 minutes mark and while it takes some determination to sit through the whole event, it takes its time to unfold and contains many interesting passages that make it worth the listen. At any one point the guitar may be laying down a rhythmic single note figure and then drop in some chords while the sax bounces melodic figured off the morphing structures, then the roles may shift or transform into other shapes and sounds. This is a conversation that never ends - it's one held in music and while there may be lulls and heated moments, there is no time when the ideas dry up. Thanks for the review. Think I'll give it a listen.